Fasting begins with the mind: only when we dispose of psychological debris can we permanently remove accumulations of impurities on a physical level. This is the tenet of the master of fasting Ruediger Dahlke. Thousands of people have successfully detoxified themselves using his methods. 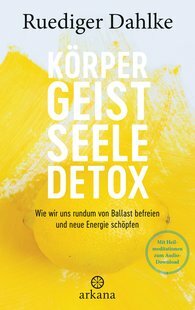 In this compact guidebook for body, mind, and soul, Dahlke presents the essentials of his practice-proven detox knowledge. For ridding ourselves of toxic emotions such as anger and fear he recommends meditation and soul travel, and on the physical level a low-calorie diet, sweating cures, and an anti-fungal diet. Deleterious thoughts and feelings are dissolved, and then the physical burdens as well are slacked off, layer by layer. In the end, nothing stands in the way of experiencing the wonderful feeling of lightness.